Mickey and Oswald's cooperative adventure is graphically beautiful, but looks aren't everything. Check out this latest vignette from the developer that showcases some different styles of play. Mickey Mouse and Oswald the Lucky Rabbit work to rebuild the Wasteland in this gameplay vignette for Disney Epic Mickey 2: The Power of Two. Junction Point Studios, the developer behind Epic Mickey 2, is showing off Fort Wasteland as part of its presence at PAX 2012. Disney released a video showing the opening cinematic intro for Epic Mickey 2: The Power Of Two. Our hands-on time with Epic Mickey 2 reveals the cooperative potential of Mickey Mouse and Oswald the Lucky Rabbit. 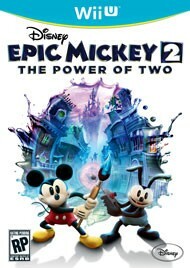 With Epic Mickey 2: The Power of Two, Warren Spector is creating the first Disney video game musical.